There are a few things to remember and to consider before selling your home. Read and learn some tips. First, do a safety inspection, said Keith Christian, chairman of Renovation Realty, a five-year-old company that is both a real estate broker and a general contractor. Be sure to check out the furnace, gas lines, fire door to the garage, as well as the electrical and plumbing systems. Older homes should be checked for cracked heat exchangers. Next, work on curb appeal, which includes the front landscaping, front door, front porch and even the address sign. Part of the wide range of services Renovation Realty offers to get a house sold is a curb-appeal package. That includes everything from landscaping to washing the windows and checking the hardware on the door. While many homeowners are switching to drought-tolerant landscaping, grass makes a favorable impression on homebuyers. “We still find that sod is popular. Buyers love green. Green sells,” Christian said. Upgrades to the interior of the home depend on the market and the neighborhood. If a home is in a great location, it can sometimes sell “as is.” But, Christian said, about 85 percent of the homes Renovation Realty sells need some sort of upgrades to get the best price. The company is currently renovating 15 homes throughout the county and has 20 homes on the market. John Raimey recently sold both his condominium and his mother’s house in Paradise Hills because the whole family moved to Pensacola, Fla. His mother’s home, a single-family, three-bedroom, 1.5-bath house, was in need of major repairs after it had been rented for five years. The project, which he hired Renovation Realty to complete, included replacing the carpeting, the doors and most of the kitchen, plus painting and restoring the garage, which was used as an extra room, back to its original use.“They picked out the materials, and we approved them pretty much up front,” Raimey said. The company pays for the cost of the renovations and is then reimbursed through escrow once the house is sold. The cost of the project is a fixed price, just like any contractor. Services range from merely cleaning a house to a full makeover. Raimey’s condominium only needed minor refinishing and was sold within 30 days after he contracted Renovation Realty. Cosmetic upgrades are centered on the kitchen, bathrooms, flooring and paint. “With a kitchen, you get the most bang for your buck,” Christian said. 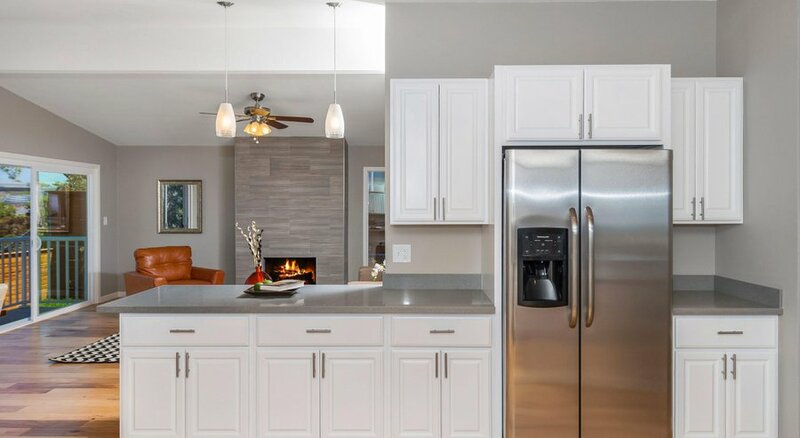 An easy, cost-effective upgrade is to install stainless-steel appliances. “It goes a long way to hide blemishes if the appliances are all modern and working,” Christian said. A coat of paint also does wonders to brighten a house. Master bathroom renovations are also a good investment, he said. If a home doesn’t have a master bathroom, the company looks at ways one can be added without altering the home’s footprint. © 2019 Chattanooga Association of REALTORS®. INFORMATION DEEMED RELIABLE BUT NOT GUARANTEED. The site does not contain all listings available through the MLS. Keller Williams Realty | Barry and Diane Evans - The Evans Group does not display the entire MLS of Chattanooga, Inc. database on this website. The listings of some real estate brokerage firms have been excluded. IDX information is provided exclusively for consumers' personal, non-commercial use and may not be used for any purpose other than to identify prospective properties consumers may be interested in purchasing. Data is deemed reliable but is not guaranteed accurate by the MLS or Keller Williams Realty | Barry and Diane Evans - The Evans Group. This site was last updated on 2019-04-24T11:08:54.153.